Master IBM's Breakthrough DAD Process Framework for Succeeding with Agile in Large, Complex, Mission-Critical IT Projects It is widely recognized that moving from traditional to agile approaches to build software solutions is a critical source of competitive advantage. Mainstream agile approaches that are indeed suitable for small projects require significant tailoring for larger, complex enterprise projects. In Disciplined Agile Delivery, Scott W. Ambler and Mark Lines introduce IBM's breakthrough Disciplined Agile Delivery (DAD) process framework, which describes how to do this tailoring. DAD applies a more disciplined approach to agile development by acknowledging and dealing with the realities and complexities of a portfolio of interdependent program initiatives. Ambler and Lines show how to extend Scrum with supplementary agile and lean strategies from Agile Modeling (AM), Extreme Programming (XP), Kanban, Unified Process (UP), and other proven methods to provide a hybrid approach that is adaptable to your organization's unique needs. They candidly describe what practices work best, why they work, what the trade-offs are, and when to consider alternatives, all within the context of your situation. 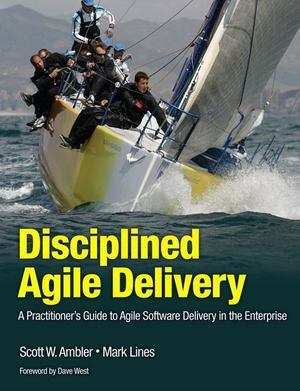 Disciplined Agile Delivery addresses agile practices across the entire lifecycle, from requirements, architecture, and development to delivery and governance. The authors show how these best-practice techniques fit together in an end-to-end process for successfully delivering large, complex systems--from project initiation through delivery. Coverage includes Scaling agile for mission-critical enterprise endeavors Avoiding mistakes that drive poorly run agile projects to chaos Effectively initiating an agile project Transitioning as an individual to agile Incrementally building consumable solutions Deploying agile solutions into complex production environments Leveraging DevOps, architecture, and other enterprise disciplines Adapting your governance strategy for agile projects Based on facts, research, and extensive experience, this book will be an indispensable resource for every enterprise software leader and practitioner--whether they're seeking to optimize their existing agile/Scrum process or improve the agility of an iterative process.